Chicago (population 2.8 million) is located in northeastern Illinois in eastern Cook County. Lake Michigan, the Chicago and Illinois Rivers, and the Des Plaines River are the main waterways to and from town. I-90, I-94, I-55, and I-57 will all lead you to the "Windy City." From what started as a small village in the early 1800's, Chicago has grown to the nation's third-largest city and one of the most famous places in the world. Sacred Heart High School was first opened in 1867 as St. Stanislaus School at Holy Family Parish (also referred to as "The Branch School"). One hundred and fifty students found their way into a one-story frame building on West 18th Street to begin classes on August 19th of that year. A parish redistricting due to the growth of the city of Chicago (even with the Great Chicago Fire of 1871) changed the name of the school to Sacred Heart in 1873, and by 1878, the student body numbered 950 when the school moved into its new four-story building. The Jesuit Order was in charge of the school during the 1890's and went thru a reorganization at the time. It was decided to close the school in 1896 as the Jesuits felt they could no longer run the school. 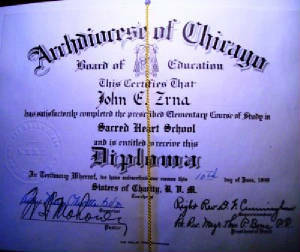 Students were accepted at the Academy of the Sacred Heart or at nearby Chicago Public School locations to continue their education. The school was reopened in 1937 by the Sisters of Charity of the Blessed Virgin Mary (BVM) as a two-year high school for boys and girls on the third floor of an parish elementary school. The school went to an all-girls' enrollment in 1943 when the lack of space and proper facilities for boys necessitated the change. 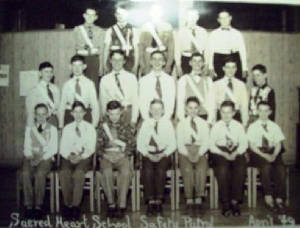 Sacred Heart went to a three-year school in 1945, then became a four-year school in 1947. The enrollment peaked at 140 girls in the fall of 1952, but could not hold on for the remainder of the decade. Citing inadequate facilities and low enrollment, the BVM community appealed to the Archdiocese of Chicago to close the school in the early part of 1959, which was granted. Students were transferred to St. Mary's High School, which was also operated by the BVM sisters. The fate of the school building is unknown. Anyone who has information about this can contact us at the addressed listed below. During our research, we were unable to find any information regarding any activities that the school provided for its students at Sacred Heart. One would believe that dances, parties, GAA, plays, yearbook, and other types of activities were offered to those students. We would like to hear from an alumnus or friend of the school to fill us in with the details. 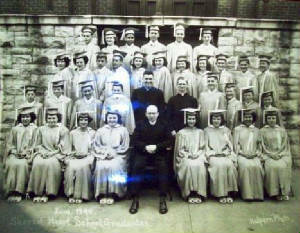 "I was a student at Sacred Heart (18th St.) from 1938 to 1940. I then went on to DeLaSalle Insttute. Sacred Heart was in two buildings on 18th St. The nuns lived in a separate building immediateltly east of the school buildings. Our courses were just general high school courses. Times were tough and tuition was only $1 a month. "The parish church was one block away at 19th and Peoria...it was also named Sacred Heart. It was destroyed by fire some years later but I don't what year. The parish was my parent's first parish. We lived in the middle of the between 18th and 19th on Peoria. I was baptized there. I was living in St. Basil Parish when I attended Sacred Heart. My father learned about Sacred Heart from his aunt, who also was living on Peoria street. "We had no real scheduled outside activities, but we did have organized activities in school. Several friends and I organized a basketball team at a nearby park district. When I attended Sacred Heart, I went to my great aunt's home for lunch almost every day. Most of my classmates came from the immediate area of Sacred Heart parish. I remember the pastor of the church was named Walsh. I have a lot fond memories of my days at Sacred Heart. Names I remember were Tony Donatelli, Mae Canty, Ed Heery, Noreen Snith, and Jack Hullinger, however I have no knowledge of their whereabouts. Andy Pollard and Ed Walsh also went to DeLaSalle with me. 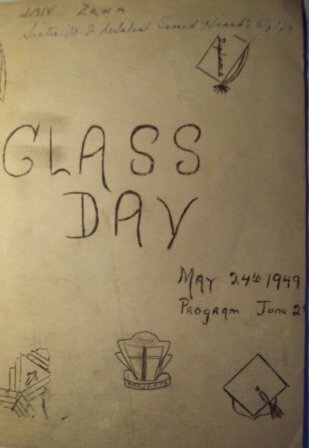 We graduated DLS in 1942. "A nun I remember was named St. Cyprian. My memory will take me no further, thanks for bringing many memories back to me." "I attended Sacred Heart grammar school up until 1959 with my sister. Our last name was Paciga.. My name is Georgene and my sister is Catherine and another sister is June. We lived at 1710 W. Newberry. "Our gym class may have been held once a week and we walked to Davorek Park for that. The names I remember Sister Shamus and Miss O’Brien. "The nuns would ring the bell (a hand bell) at the start and the beginning of each day. Father McDonald was one of the priests at Sacred Heart Church. We made our Communion at Sacred Heart Church. "Names I remember Judy Radovich, Ralph Tarka, Karen and Nancy Fusco, Sharon Guest (her folks owned Harry’s Resturant on 22nd and Halsted). I remember a Jack Galbave, Hope Lang, Mary Ellen Johnson. "I still have my second grade class picture." "I remember the song was 'DEAR SACRED HEART SWEET SACRED HEART, BURNING AND YEARNING...'"
"The priests names that were part of Sacred Heart Church were Father Burns, Farther McDonald, Farther Vanish and Farther Lane. In 1948 when I graduated from Sacred Heart school the Nun's name was Sister DiSilva. I still keep in contact with Jen Donatelli. I painted the kitchen ceiling of the Donatelli's." "I attended Sacred Heart Grammar School in the 5th grade in 1951-1952.
the first time that I knowingly met someone who was Jewish." I became a "gofer" for our school principal Sister Olivette. Since I knew Chicago like the back of my hand. For something to do I rode the El all day long in the summer. My buddy and I used to sneak on the El platform and ride all the transit lines back and forth all day and never got caught. Oh the sisters always sent me downtown for flowers around Wabash and Van Buran. I was also like some kind of courier between schools picking up or dropping off envelopes ( email was't invented yet). The flower thing was more frequent. I never had to pay for them....I just picked up a bouquet and gave them to the Sisters. They did give me carfare which was about twenty cents for a two way ride. Although at times I flipped a truck and saved the fare to spend at the penny arcades that lined State down 18th Street from Minsky's south of Van Buren. Once as I was returning with a bouquet of flowers I flipped a truck down 18th Street but the driver stopped suddenly which signaled he knew I was back there. I took off running down Canal Street followed by a man. After five blocks I stopped and waited for the man. I figured he thought I stolen something from the truck. When he approached I showed him the flowers but he grabbed my t-shirt and took me back. He saw that the truck was still locked so he kicked me in the rear and I walked back to school. One cherished activity was the choir. We had a three voice choir in our class that really excelled. For a bunch of street rats (we likened ourselves to "The Dead End Kids") we really had it together. We sang for the nuns, Sunday mass, Benedictions and stage performances at St Stanislaus hall. However; Christmas day and midnight mass was the best honor to our class. As we grew older another activity we enjoyed was getting out of class to clean the church. The girls polished the wooden pews while the guys used a machine to polish the floor. All the guys took turns sliding that machine back and forth. During lent the school got to see the passion play at the local theater. One year we went to the Palace Theater on Halsted Street between 18th and 19th Streets. Another year the whole school marched down to Thalia show on 18th near Allport Street.. In the school auditorium we had visiting orchestras, movies, class plays, and ringworm exams. By eight grade the church began to allow roller-skating in the church basement. It had a great wooden floor which was comparable to any skating rink. It was also used for dances and seasonal parties such as Halloween and Valentines Day..
Another time a few of us eight graders were allowed in the convent to move furniture and clean the floor in their reading room. Afterwards ; we were brought down to the basement where the cooking and laundry was done. We were given a slice of apple pie baaked by one of the nuns. I was floored. I didn't know a nun could bake so damn good! I kept in touch with Father Lane until he died as pastor of Santa Maria Del Popolo. Some of my classmates like Manuel Adame went to California, Jim Sheeh to the Army and went to New York, Beverly Mihalek ended up in Colorado, I went to Arizona, other classmates stayed in Chicago ot it's suburbs like Ruth Omalley, and Maryjane McCarthy, and my sister to New Lenox. During the war years our school sold enough war bond stamps to donate a jeep to the army. One day two soldiers brought a jeep into the school yard and invited everyone to sign their names allover the olive drab vehicle. Since there was no school cafeteria, once a week I went to Walsh public school (two blocks south) and bought lunch. It was milk, with ground beef and gravy over potatoes, which is still my favorite. Tuition was one dollar per month in 1949. We had 33 students in our class which meant 33 dollars a month to the teacher......that's why they had the sisters of charity running the school. Through the years I couldn't see the girls. I will send 7 pics from third grade wearing high-top laced boots to high heels in eight grade, and the guys from wearing surplus army boots to loafers. The class of 1949 was quite a trip, I wouldn't trade for anything."